Arctic Kingdom launches a new mobile-friendly website to make discovering the Canadian Arctic accessible for all. With featured videos and photography, streamlined navigation, and enhanced search capabilities, travellers can now plan an Arctic bucket list adventure or photo safari with ease. Enhanced search capabilities lets travellers “build their own adventure”. The Canadian Arctic is a vast destination, with extraordinary experiences often available only at specific times of year. 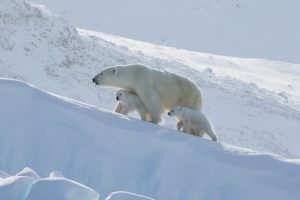 This includes opportunities to view unique wildlife found only in the Arctic, including polar bears, narwhal and walrus, and natural phenomena such as the Northern Lights, Midnight Sun, icebergs and glaciers. By allowing search by season, wildlife, or experience, travellers can find the perfect trip, at the ideal time, to bring their Arctic dreams to life. Other features of Arctic Kingdom’s new website include an interactive map that allows users to discover lesser-known areas of the Arctic, and the wildlife, landscapes, experiences, and culture that make it so special. Additionally, a special section for travel agents features tools and information to help them inspire clients, and a professional services section is designed to help organizations seeking Arctic logistics, such as film and TV production houses.